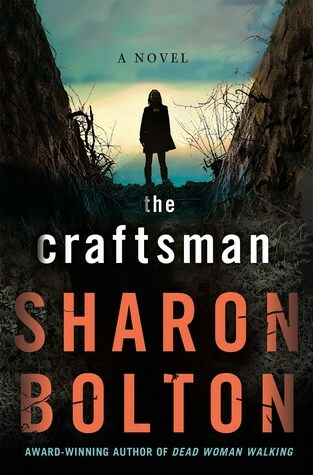 Thank you to Minotaur Books and Raincoast Books for gifting me a beautiful hardcover copy of The Craftsman by Sharon Bolton to read and share my review. This was the first book by Sharon Bolton that I have read and after reading so many wonderful reviews on her books recently on social media I was thrilled to have received a copy of this book to read and review. Part I takes place in 1999 and is written from the point of view of Assistant Commissioner Florence (Flo) Lovelady. The Craftsman begins at the location of a funeral for a man named Frank. There are very few people at Frank’s funeral to mourn his passing, and the majority that are there are actually there to witness the fact that he has passed on and is being buried. One by one people walk up to his casket and spit onto the casket…There are no tears…there are no flowers…. Why would people want to spit on Frank’s casket? How could these people be so heartless and cruel? Florence Lovelady lived in the house owned by Frank years ago, where she was a border in his family home along with a few other borders. At the time she was living there, 3 teenagers had gone missing and were feared to have been buried alive…only to have been discovered too late. Part II takes place in 1969 when Florence was a border in Frank’s family home. We learn more about the 3 teenagers that suddenly disappeared without a trace and the search for their whereabouts. Strange things happen in this part, not only the disappearances of the teenagers but also talk about witch spells, magic and dark sinister events at play. Part III jumps back to 1999 again and Florence continuing to uncover what truly happened all those years ago and the disappearances of the 3 teenagers. Slowly we being to get answers about what truly happened all those years ago and get closure to the story. I thoroughly enjoyed reading this book. I loved how each chapter was short. The book was thrilling, chilling, creepy and gave me the chills at certain points. I loved how the writing pulls you in and has you flipping pages to see what you would find out next. I found this book to be a very addictive read and I was reading late into the night, not wanting to put this book down. And with all the short chapters, I found myself frequently saying “Ok…just one more chapter”. I loved the main characters personality. Florence was a no BS character who was determined to do what she thought was right, even if it got her into trouble with her superiors. If she felt she had to dig deeper into a case and uncover the truth, or had a hunch about something, she would not back down and would follow up on it despite the consequences. She was a badass and I loved watching her character unfold and develop in the story. There were several parts in the book that I did not see coming at all. I had develop several theories and ideas of what had happened and where the story was going, only to be wrong time and time again. It had me on the edge of my seat and had me guessing every step of the way and I loved that! I am definitely a Bolton fan and I look forward to reading her other books. A definite must read and recommended book! I would love to hear your thoughts if you’ve read this book, or if it is on your TBR.